Time: 5:45 – Discussion starts promptly at 6pm so please arrive at least 15 minutes in advance! 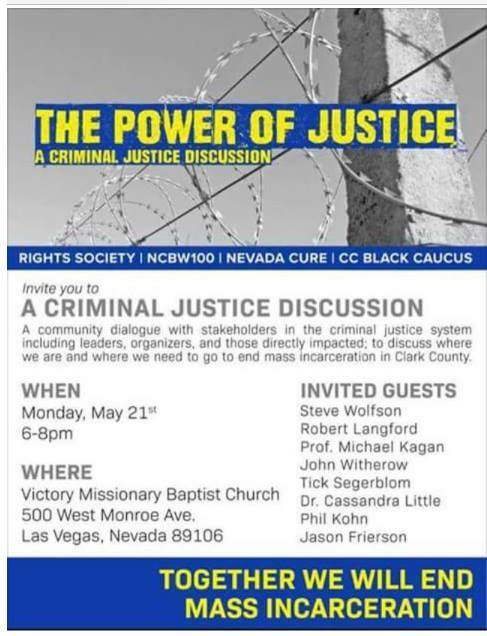 Poster for the Power of Justice – A Criminal Justice Discussion, May 21st, 2018, in Las VegasPlease come to the Power of Justice: A Criminal Justice Discussion forum on Monday 21st of May in Las Vegas. John Witherow among others of Nevada Cure will be participating! Together we will end mass incarceration!